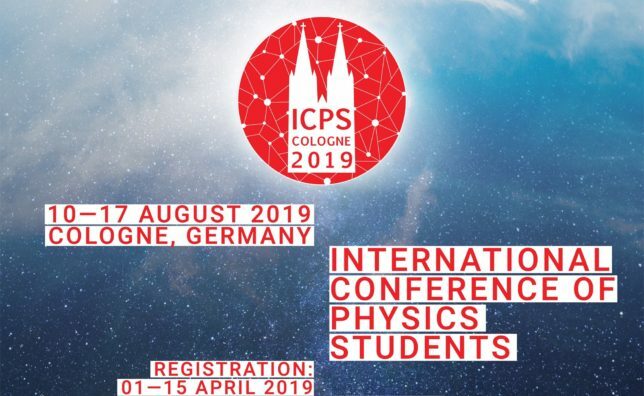 Registrations for the International Conference of Physics Students (ICPS) 2019 have opened in a second round from April 1st to the 15th. If you missed the first round in February, you have an opportunity to sign up for this awesome conference in Cologne, Germany, where Science, Culture and social activities with hundreds of your fellow Physics students will make for a week of fun, learning and establishing contacts and friendships across the world! In this round, the Organising Committee has launched an exciting Poster Challenge. Read about how to participate here! Check out all the ICPS 2019 information here and register through the Member Network! Remember to follow ICPS 2019 on Facebook and Instagram!